PRINT ON-DEMAND (POD) – VERY COOL « THE BRYCE IS RIGHT! – Finally, a “do it yourself” approach for book publishing. I know eBooks have made substantial gains in terms of popularity, but having a hard copy can still be very beneficial. There are many people who like the touch and feel of paper versions. In the past, if you were an author, you had to sign a contract with a suitable printer or publisher who could put it all together for you. This usually meant you or your publisher had to maintain an inventory of books. If you had a best seller, you would simply reorder stock, but if it didn’t, the books (and your cash) would sit on the shelf gathering dust. Recently, I produced a new book entitled, “Stand Up for MORALITY.” I discussed the project with my local printer. He advised me to try a new service called, “Create Space,” a “Print On-Demand” (POD) service, and a subsidiary of Amazon. Frankly, I knew nothing about it, but after exploring the web site I figured I had nothing to lose and opened an account. The intent of the site was to provide a convenient way to publish books yourself. Create Space requires you to upload a PDF file representing your manuscript. Fortunately, I have been well versed in desktop publishing for a number of years and know how to create a PDF file, so this didn’t present a problem to me. To others though, this can be their biggest problem in using the service. If you know how to use a word processor or desktop publishing tool, and convert your work to a PDF file, you’ll do well. Otherwise, I would recommend you hire someone to layout your book for you. After you have submitted the manuscript, an electronic analysis is performed to check layout problems which you should be able to easily correct. While that is going on, you can design your book cover. This can be done either as a separate PDF upload, as a selected template from a catalog they make available, or you can request professional assistance, which they will gladly perform for a fee. I tried uploading my own cover and also used a template (on another book) and was happy with both approaches. As part of the initial setup, you must also input an ISBN number, either one you selected yourself, or they will get one for you (for a modest fee), and will automatically create a shopping bar code which is affixed on the back cover. When you are ready with both the manuscript and cover, the book is assembled and submitted for review by an analyst at Create Space. This process takes approximately 24 hours. As a warning, do not submit your book prematurely; take your time, and make sure you go into the review process with confidence. Otherwise you’ll have to go through another 24 hour review cycle, or maybe a third or fourth. Assuming acceptance, your book is now ready to be published on-demand. This means you can start marketing the book yourself. Better yet, let Amazon and Create Space use their marketing arms to help you. Of course, there will be royalties for their efforts, but it may be worth it. As the author, you are entitled to purchase books at a reduced rate. The best part is, no inventory. 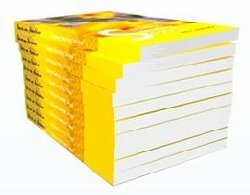 Books are printed on-demand, packaged, and shipped directly to customers in a very timely manner. Create Space also provides the means to create and market an eBook if you are so inclined. Even though I discovered it only recently, the Print On-Demand (POD) technology has been around for ten years and is steadily improving. Although I used Create Space, there are other offerings available. I selected Create Space for two reasons: it’s relationship to publishing giant Amazon, and because of the service’s ease of use. Frankly, I was impressed by the quality and service. LAST TIME: WHEN “UP” IS NOT THE ONLY WAY – What direction are we headed, “Up” or “Down”? This entry was posted on August 7, 2013 at 6:00 am	and is filed under Technology. Tagged: Florida, palm harbor, POD, PRINT ON-DEMAND, The Bryce is Right, tim bryce. You can follow any responses to this entry through the RSS 2.0 feed. You can leave a response, or trackback from your own site. Really cool, Tim. . . .
I’ll be sure to do that when the time comes. Thanks Tim, got a book in the making will keep this as a resource. I am practicing the writers moto for good writing …rewrite, rewrite, rewrite rewrite…….